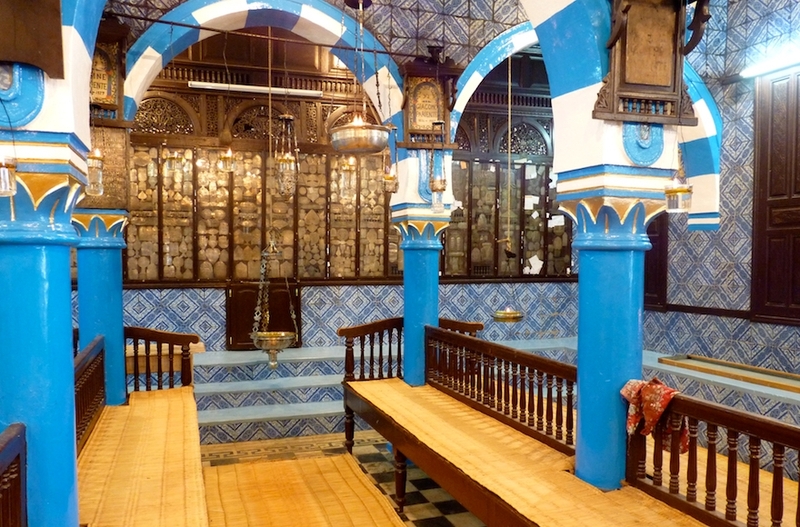 DJERBA, Tunisia (JTA) — Anticipating the sun’s rapid ascent in the African skies, six barefoot men align themselves early in the morning in a drafty corridor of the still-cool interior of Africa’s oldest synagogue. Casually humming a biblical hymn in Hebrew, they and an Israeli journalist hold off on holiday prayers in the hope of performing them in a minyan — the quorum of 10 Jewish men that Orthodox Judaism mandates for certain prayers, and a threshold requirement for any viable community. 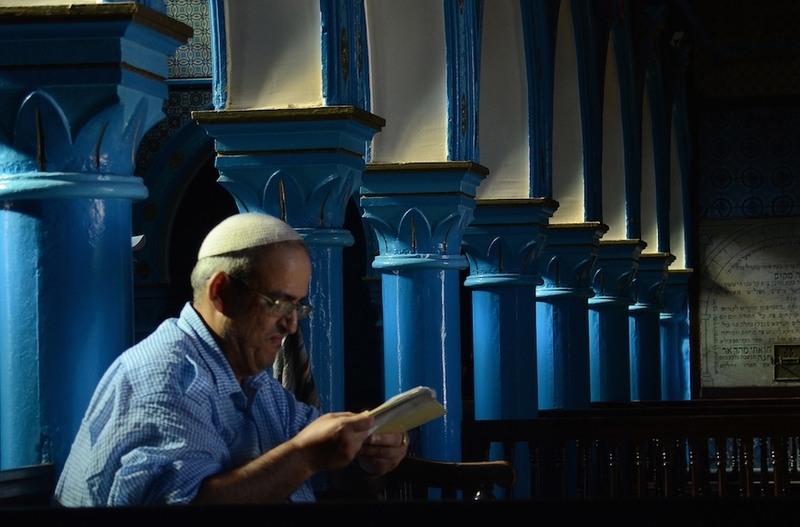 Members of a dwindling Jewish minority on this Tunisian island, they wait for hours under the ornate arches of the centuries-old El Ghriba Synagogue in Riadh, a town where thousands of Jews once lived but now has only a handful of Jewish families. It will take a while for reinforcements to arrive: three more Jews from Hara Kebira, the last remaining Jewish town in Djerba, located four miles north of the synagogue. Belonging to one of the Arab world’s few active Jewish congregations, their patience reflects a determination to preserve their ancient tradition in a tight-knit community of 1,000. Many members feel duty-bound to remain on the island even though they can envisage no future here for their children. Nonetheless, various factors, including state-tolerated violence against Jews following Israel’s victory over its neighbors in the 1967 Six-Day War, have gradually almost emptied Tunisia of the 110,000 Jews who lived here before 1970. A few dozen families left following the 2011 revolution that briefly installed an Islamist and anti-Israel party in power. That bout of instability was the latest chapter in the story that led to the near-total disappearance of centuries-long Jewish life from the Arab world amid hostility and poverty. Jews on Djerba have also experienced these problems, not least in the explosion that al-Qaida terrorists set off outside the El Ghriba Synagogue in 2002 in which 20 people died, including 14 German tourists. The explosion occurred three weeks before the Jewish holiday of Lag b’Omer, when hundreds of tourists, including from Israel, gather at the El Ghriba for a pilgrimage that is particularly popular among Jews of Tunisian descent. “It’s the only time of the year that we can count on having a minyan,” Dee’ie said at the synagogue, where the sounds of the shofar on Rosh Hashanah blended with the Muslim call to prayer and the chiming of church bells. After prayers at the synagogue — a normally quiet place where the only sounds are the wind’s rustling of the wicker mats on the floor and the crackling of the glass oil lamps hanging over the windows — the 10 men walk to a deep well nearby to perform tashlich, a ritual of atonement requiring a large body of water. Running for 200 feet beneath the sun-baked desert soil, the well used to service a complex of communal buildings and orchards belonging to the thousands of Jews who once lived here. But now it stands at the edge of a barren and open field. Then the men head to the home of Joseph Azria, 42, and his ailing parents — three of the few Jews still living in Riadh — to blow the shofar for Azria’s father, who is too old and weak to walk to synagogue. The old man smiles as his only son still living in Tunisia speaks about his hope for finding a Jewish bride in Morocco and possibly moving with her to Israel. The synagogue now is surrounded by anti-tank obstacles and permanently guarded by a platoon of soldiers toting machine guns. They forbid visitors from taking pictures and turn them away altogether whenever members of the Jewish community are in the building. Photography is also forbidden inside Hara Kebira, which has permanently manned checkpoints at its two entrances. Police officers in civilians clothes patrol the town, quickly intercepting and questioning anyone who seems out of place. Inside Hara Kebira, which has a chief rabbi, four synagogues and three Jewish schools, Jews walk around wearing kippahs, greeting passers-by with “shalom” and wishing one another “Shanah tovah” – Hebrew for Happy New Year. Sukkot, huts with palm-tree canopies, are erected in every yard on the Jewish holiday and the whole neighborhood falls silent on Yom Kippur, the Jewish Day of Atonement. Still, Hara Kebira residents do not advertise their Jewish identity outside their town: The men don hats over their kippahs upon leaving the enclave. “It’s a very good thing the police are here, they protect us, just like they protect you in Israel,” Dee’ie, who studied at a religious seminary in Israel in 2007. 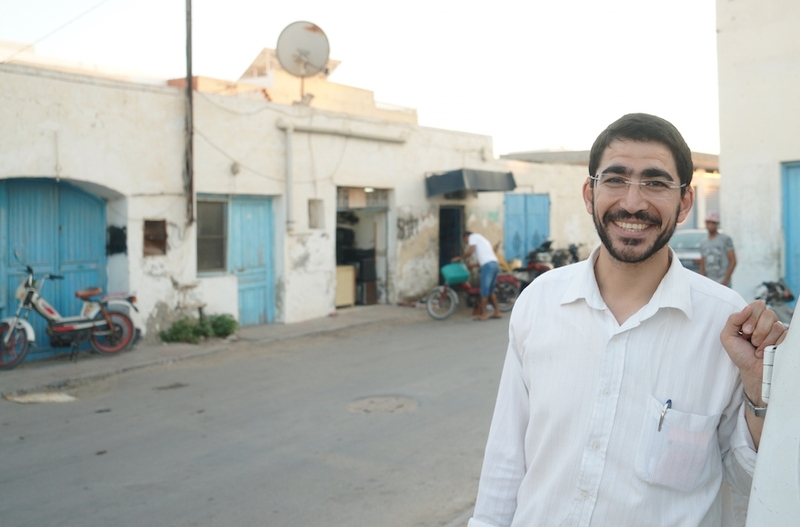 He returned to Hara Kebira but moved away last year to Zarzis, where his wife was born and he teaches a classroom of 15 children from that city’s Jewish community of 130 members. Dee’ie’s father, the community’s most experienced mohel and schochet – respectively the person who performs circumcision and the ritual slaughter of animals – still lives in Hara Kebira with his wife and Dee’ie’s nine siblings. They meet on holidays for elaborate meals rich with alcohol, including a kosher wine that the Dee’ies produce themselves because importing it is too expensive and complicated in Tunisia, a Muslim country where many oppose the sale of any alcohol. Despite the challenges of living here, Djerba is one of the few spots in the region where a sizable Jewish community persists, thanks to what locals — Jews and non-Jews alike – say is a special set of circumstances: the local population’s relative immunity to waves of xenophobia and political agitation seen on the mainland. Pretty much all aspects of life in Djerba bear the effect of centuries of interaction among Muslims, Christians and Jews, who have lived here since Roman times. The symbol of the menorah, the Jewish traditional oil lamp, is a local icon adopted by the general population featured in decorations of government buildings such as clinics and schools. And non-Jewish locals are surprisingly familiar with the Jewish calendar and customs. Muslim customs clearly have also rubbed off on Jews here: They take off their shoes before entering their synagogues the way Muslims do before entering a mosque. This familiarity breeds intimacy and mutual assistance, according to Ridha Arfaoui, a non-Jewish resident of Riadh who owns a small restaurant near the El Ghriba Synagogue. “I grew up with the Jews, we had a Jewish neighbor on all sides of our house and on Yom Kippur we would not turn on the radio out of respect,” he said. But in Tunisia, expressions of anti-Semitism, often featuring anti-Israel vitriol, continue to occur, reminding the country’s remaining 1,700 Jews “that the Arab, he is very easy to incite,” Dee’ie said. A recent example came when Tunisia joined several other countries in banning the film “Wonder Woman,” apparently because its lead character is portrayed by the Israeli film star Gal Gadot. The Jewish-French philosopher Bernard-Henri Levy, who is not Israeli, was greeted during a 2014 visit to Tunisia by dozens of Islamists carrying signs calling on “Levy the Zionist” to leave. The invitation to a Tunisian festival in July of the Jewish comedian Michel Boujenah provoked protests in Tunisia that local anti-racism activists said were anti-Semitic. Tunisia has several pending bills, introduced by Islamist and secular nationalists, proposing a blanket boycott on Israel and a ban on any Israelis from entering the country. Notwithstanding, Tunisia’s government is showcasing its Jewish heritage sites, including Djerba, whose ancient synagogue is on Tunis’ list this year for locales put forth for recognition as world heritage sites by the United Nations. The government has made several statements about the positive role of its Jewish citizens, invested considerable resources in renovating sites of worship and is considering allocating two seats in parliament for representatives of the Jewish community. But in parallel, authorities in Tunisia are “quietly confiscating” Jewish antiques, including a 15th-century Torah scroll whose whereabouts the government is refusing to disclose, according to an expose published last month by the French news site Dreuz. The effects of anti-Semitism in Tunisia may be “unpleasant at times, but they are not a threat to the survival of this community,” said Dee’ie, who was ready to immigrate to Israel last year with his wife because they could not find an affordable apartment to their liking in Zarzis.